« Prev. Page: The Political Cabaret: "ABC"
Das Schwarze Korps was a typical Nazi newspaper, constantly defaming all "enemies" of the fascist state. In this issue, from 14th. 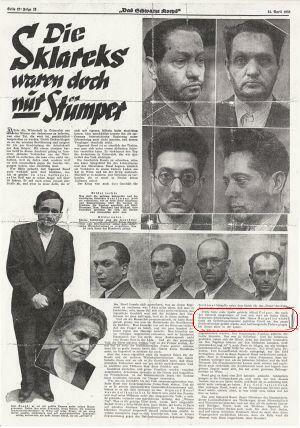 April 1938, several jewish people are described as economic criminals, earning money from other peoples' misery, etc. Hans Margulies is also mentioned by name, as a Court reporter who constantly criticised every verdict, and defended their misdeeds. Hanns Margulies widerfocht als Gerichtsreporter jegliches Urteil an, das gegen Großverbrecher gefällt wurde, und hoffnungsvolle Federn gingen bei ihnen alles in die Lehre. Ich lebe jetzt als politischer Flüchtling in Prag. In July (?) 1938 Hans and his family fled to some of Maria's relatives in Prague. (Memo to self: Vaniczeck ?? perhaps one of Maria's family married a Vaniczeck ?). (1) The artist Irma Stern would have sponsored Maria and the children in South Africa, but couldn't sponsor the whole family (possibly because Hans was jewish). The family discussed it and Maria vetoed the ideas. (2) Hans and family were scheduled to go to Finland with the Red Cross. At the last minute the organisers came and said, they had to get someone else out (a biologist), immediately, as he was about to be arrested, but Hans and his family would definitely be on the next flight, wherever it was going. This turned out to be to Britain. (3) One of the Rothschilds, using his own money, bought, hired or chartered a bomber plane, had seats installed in the fuselage and organised flights to Britain for 400 jewish families, among them Hans and his family. At the outbreak of war they were interned, along with other "enemy aliens" at Bacton-on-Sea, Norwich. ... In his application for release, Mr. Margulies gives your name as a reference, and the Tribunal would, therefore, be grateful if you would confirm, as far as possible the following statements he makes. 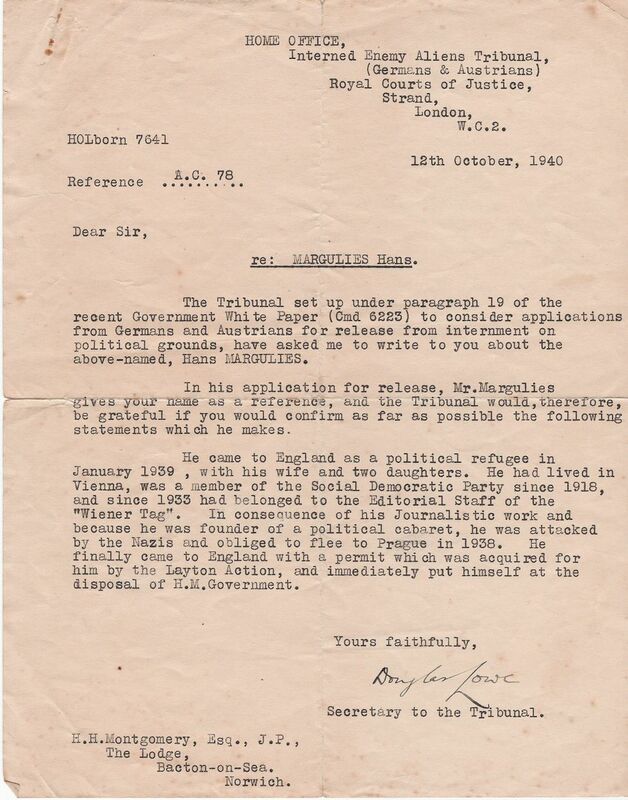 He came to England as a political refugee in January 1939, with his wife and two daughters. He had lived in Vienna, was a member of the Social Democratic Party since 1918, and since 1933 had belonged to the Editorial Staff of the "Wiener Tag". In consequence of his Journalistic work and because he was the founder of a political cabaret, he was attacked by the Nazis and obliged to flee to Prague in 1938. 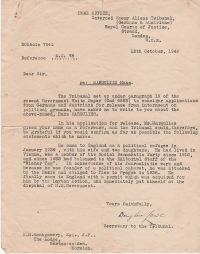 He finally came to England with a permit which was acquired for him by the Layton Action*, and immediately put himself at the disposal of H.M Government. Brett House, 198 West Hill, Putney, SW 15. * The "Special Search List GB" quoted above was the Nazis' (SS, SD, Abwehr ?) list of "Enemies of the State". In the event of an invasion of Britain, special teams would be sent out to round up anyone on the list. [...] Und etwas schönes: also von Epstein, oder vielmehr [???? ], bekommen wir Geld und dann noch 500 Kopek von der Kirche, das hat jeder gekriegt, der durch die Sir-Walter-Layton-Aktion (wenn er bloß so hiesse, aber irgendwie wird es schon stimmen) nach England und Frankreich gekommen sind. ... we have been given some money .. everybody who was sent to England or France through the Sir-Walter-Layton-Action (or whatever it was called) got this. Source: My Mum's diaries, 30th. Januaury 1938. So that answers the question: "which Layton ? ".